The Alberta birding community lost a great naturalist and birder over the weekend. Ray Cromie was a retired Sherwood Park school teacher and vice principal. 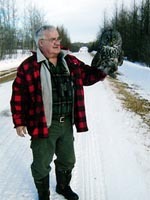 He studied owls in northern Alberta for many years and in the 1980s he became a master owl bander. I never had the opportunity to meet Mr. Cromie, but many birders across the province had the chance to learn from his extensive knowledge about birds, especially owls. Ray was a long-time and very beloved member of the Edmonton Nature Club. He was a recipient of the club’s Edgar T. Jones Conservation Award and Nature Alberta’s Loren Gould Award. Ray was probably best known as a owl and raptor bander. He banded thousands of owls over the years. Many Edmonton-area birders were lucky to experience Ray’s generosity. Hundreds of us saw lifers of several hard-to-find owl species directly because of Ray’s guidance. Besides being an expert on owls, Ray was a very knowledgeable all around naturalist. 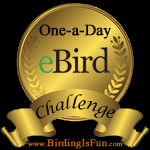 He could just as easily talk to you about warblers, or butterflies, or plants, as the nesting habitat of Saw-whet Owls. Ray was a tireless volunteer. He was always giving presentations to all sorts of groups. He led countless owling field trips for the ENC. The trips were always very popular. Folks got to get an up close look at the whole procedure of finding, catching, processing, and banding birds like Great Gray and Hawk Owls. His owl display at the club’s annual Snow Goose Chase was always a big hit with all the children. But more importantly than any owls was the way Ray showed us, by shining example, how to be a great leader, mentor, and teacher. And how to be a good, generous person. And he did it all with an awesome and charming sense of humour. If you’d like to learn a little more about Mr. Cromie, he was featured in an article from 2005 in the Edmonton Nature News, which can be found here. My deepest sympathies to Mr. Cromie’s family and friends. He will be missed by many.